The Bodmin Gospels of St Petroc's Priory, Bodmin, in Cornwall, are an important survival, providing a glimpse of Cornwall's early history. In many ways, their pages look back further still than the late 9th century when they were made. While the script in which they are written is much like that in use in contemporary France and Anglo-Saxon England, the design of many of the pages and the kind of ornament used also resemble what is seen in Irish and British gospel manuscripts from the 7th to 8th centuries. It was probably made in Brittany, a 'Celtic' area where cultural links with western Britain and Ireland were maintained. 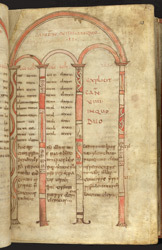 This page presents one of the canon tables, a kind of index of passages in the four gospels which tell of the same events. Canon table nine, seen here, compares passages from Luke and John. Below is a record of manumission dating from the reign of Eadred (946-955). A woman named Medguistyl and her children, Bleidiud, Ylcerthon, and Byrchtylyn, are freed from slavery at St Petroc's altar, where this manuscript probably would have been displayed. The names of clergy who witnessed the event are listed. It is written in Latin but provides valuable evidence of the ethnic make-up of Cornwall in the early middle ages as well as nearly unique witness to Old Cornish names.